I am going to Edmonton for ten days of classes with Tanja Berlin in April - so excited! The first class I am taking is four days on designing your own needlepainting picture. 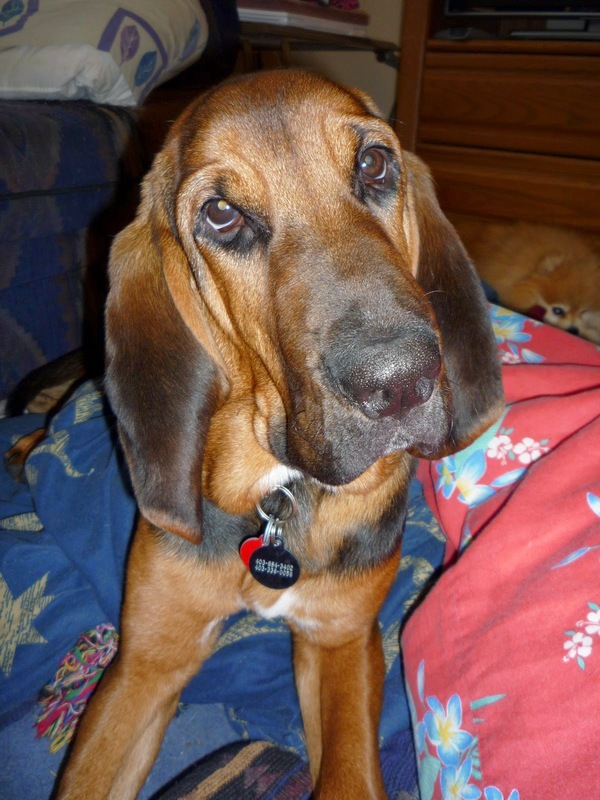 I will be stitching Duke, my daughter's older bloodhound - love that dog! This is the photo I will be using for the basis of the needlepainted or threadpainted piece I'll be working on. Isn't he the handsomest boy?! The second class will be two days of goldwork and I had to choose one of Tanja's kits for that one. 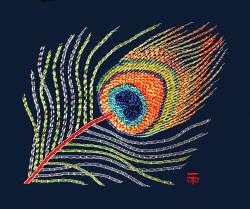 I have wanted to learn or nue for some time now so am going to do her peacock feather piece. The last class is three more days and is on designing your own blackwork pieces. No idea what I will do on that one yet but very excited. 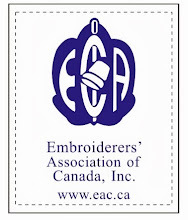 These classes are all put on by the Focus on Fibre Arts Association - a wonderful organization in Edmonton devoted to encouraging, fostering and developing, excellence and appreciation of fibre as an art form. Their goals are to promote fibre artists, to create an awareness of fibre as art and to highlight the benefits of creating fibre art. To this end, they regularly put on classes that are free to members and the yearly membership in Focus on Fibre Arts Association is only $10 a year - what a wonderful opportunity this creates to learn from outstanding teachers! I joined the organization of course and so all I need to pay for these ten glorious days is my supplies and accommodations. I have to share a photo of these adorable potholders I received from my Secret Stitcher this month. 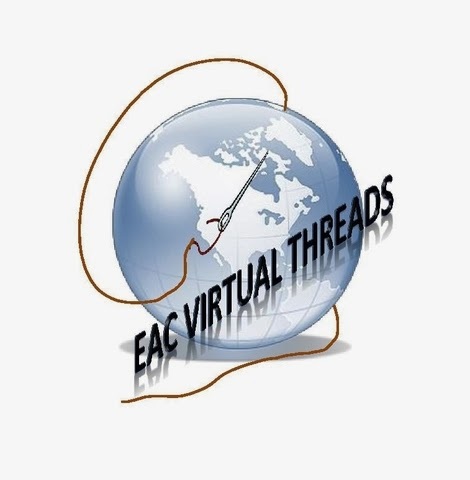 This is part of a year long exchange on EAC Virtual Threads online chapter - like a secret sister thing, except among stitchers. For February I received these potholders and I just love them - so clever and pretty. Your fingers slip under the side flaps so they are perfect for taking things out of the microwave and grabbing a pot handle. Like little oven mitts! Isn't this adorable? It arrived in my mailbox this week as a result of a Pay it Forward thing on Facebook. This cute little beaded lady is a brooch and was sent to me by Sue Thomas. Sue is one of the most creative ladies I know and I am delighted to give her little bead lady a good home. I have to send out a shout out to Karen Creftor for sharing her Bargello Heart design with us at our February guild meeting. Thank you Karen! As you can see, the ladies really enjoyed it! Now, not really fair to show you this and not tell you where to get the design, is it? I wouldn't do that to you! lol You can check out Karen's design for yourself here. Sometimes I seem to spend a lot of time keeping busy with no results. This is one of those examples. I volunteered to make the nametags for the teachers at Seminar 2015 in Calgary. The photo above shows what I was given as a guideline. This is my first attempt. First of all let me say that it was a very rough prototype! I can explain the gingham ruffle as well. The theme of this year's Seminar is Stampeding Stitches and everything is very Western! So, the rope stitch around the edge and the ruffle was my attempt to "think Western". It was a no go - the waste canvas I used didn't give me very nice lettering, the ruffle was "too much" and the rope stitch should be replaced with an actual piece of twine. This is my second attempt - didn't bother finishing it into an actual pin this time until I got the go ahead on it. Counted thread instead of surface embroidery this time to try to get better lettering. The designing, charting and stitching ate up about half of a day - surprising for such a small thing but there you have it. I'm slow! Anyway, it didn't go either - the lettering was "too hard to read" and the wording wasn't what they decided they wanted - didn't want CGNFA or EAC Seminar 2015 anymore. Refer to the first photo - was starting to feel frustrated. T|o celebrate Valentine's Day at this week's guild meeting, we had an exchange of heart ornaments. This is the delightful ornament I received from Freda Murfin. Love the beading on the edge and the way is each side is a reverse of the other! The ornament I made was not nearly as elegant - I feel rather badly. It was designed to be a door hanger since I couldn't figure out what people do with valentines' ornaments - do people actually have valentines trees, I wondered? 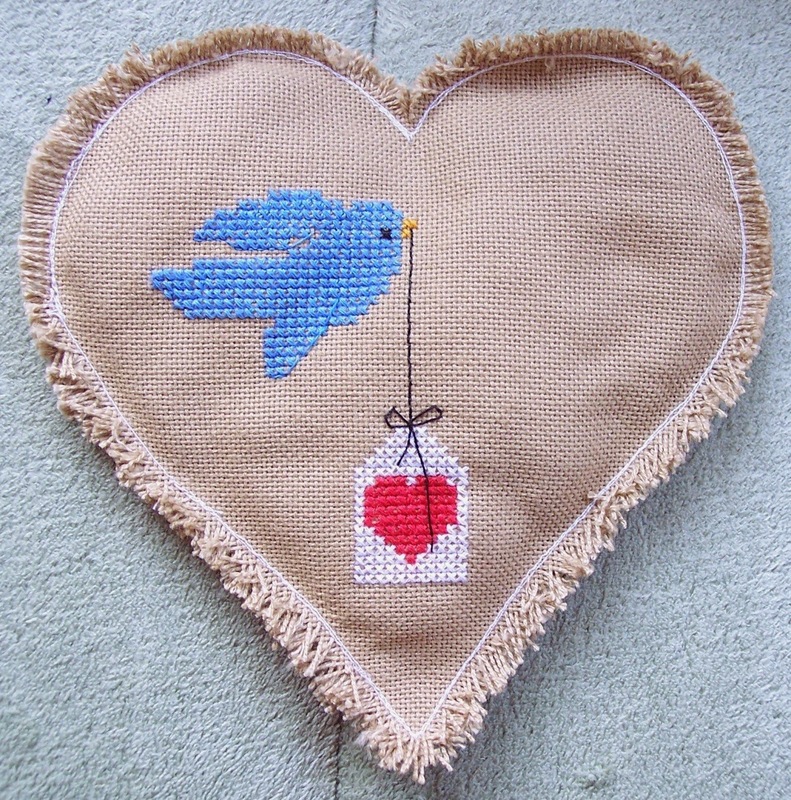 It is a simple cross stitch design on linen, sewn together and the edges frayed out to make a fringe. I intended to cover the sewing line with a white embroidered chain stitch but ran out of time. My bad! I received a wonderful gift in the mail this week from my Secret Stitcher on Virtual Threads. First of all, I was thrilled with the card - it features a Hutterite sampler which is very interesting to me since I am in the heart of Hutterite country. I was completely blown away by this needlebook! What a treasure! It has the most beautiful stitching - please click on the photo so you can see it closer.Really, really such a treasure to own. Since it came from a Secret Stitcher (like Secret Sisters except we are all stitchers) I do not know who to thank and won't until December but I absolutely love it! Thrift Store Treasure - Getting Crafty! So this is the mess I was in yesterday, bits of tape and such all spread out on the kitchen table. I am forever picking up little things at the thrift store because they look interesting. Yesterday instead of looking for a place to put this, I went ahead and used it instead. I had actually picked up two variations of this crafty kit, so I can do this again once I get more ink in my printer. They come with specially treated canvas you can run through your printer and then you assemble the frames with the canvas and voila! Some favourite photographs all ready to hang on the wall! Total investment in supplies - under $3 for both kits. Result - somewhat cool gift for a hard to buy for teen's upcoming birthday. I've been working away on Diane Scott's wonderful Apple a Day design and have the second section completed and am working on the third now. I am not sure if I lost count here or not so it may not look like it should. The phrase "original adaptation of a commercial design" is one of my favourites - sounds much better than "maybe I made a mistake but I'm not taking it out"!